Although we only had about 6 miles of hiking to do today, we still got up before sunrise. The weather was perfect for hiking. Our first stop was the mine shaft that was only about a quarter of a mile from camp. 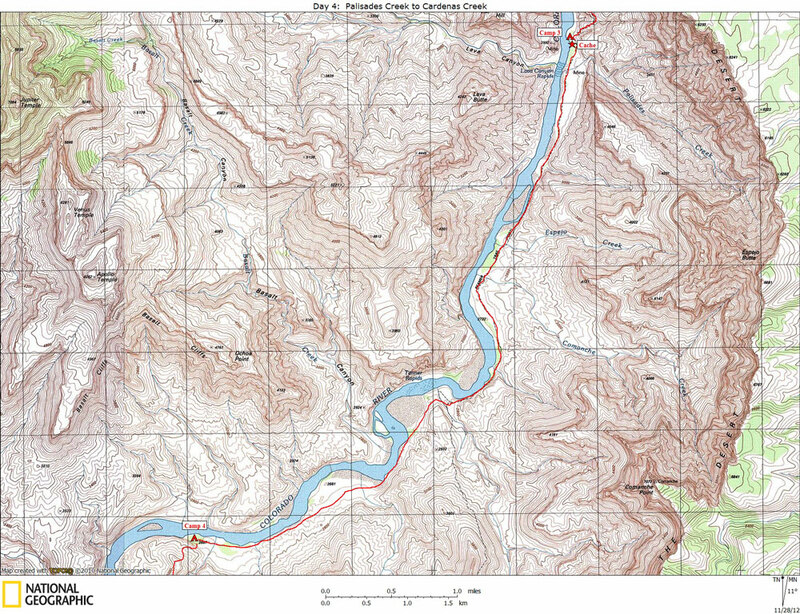 It is shown on the 7.5-minute USGS map. 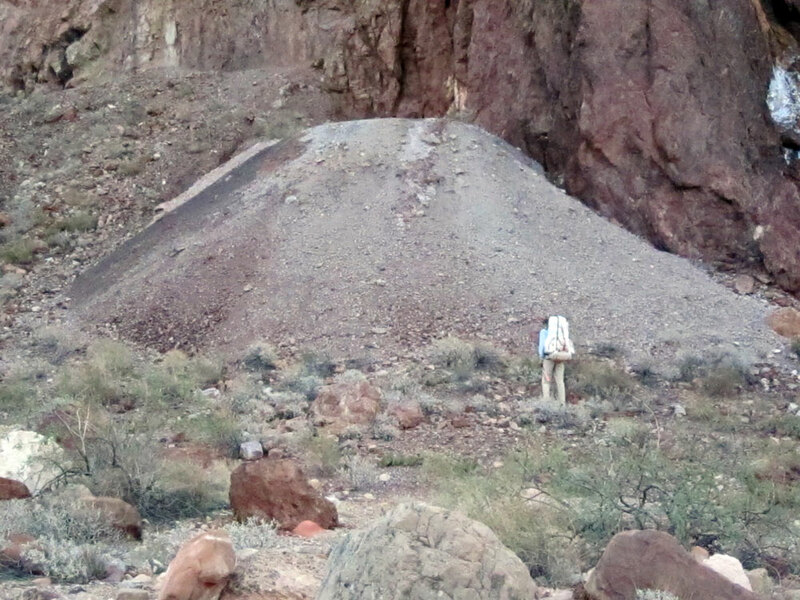 From the mine tailings, it looks to me like copper was being mined there. I assumed the mine was operated by either Seth Tanner or Ben Beamer, but after I got back I read in Kim Krumbo's book (A River Runner's Guide to the History of the Grand Canyon) that this mine was operated by George McCormick between 1880 and 1907. The main shaft has been blocked off with a heavy steel grate to protect bats. Not far beyond the mine we came to an old log cabin used by one of the miners. Copper Mine Tailings. 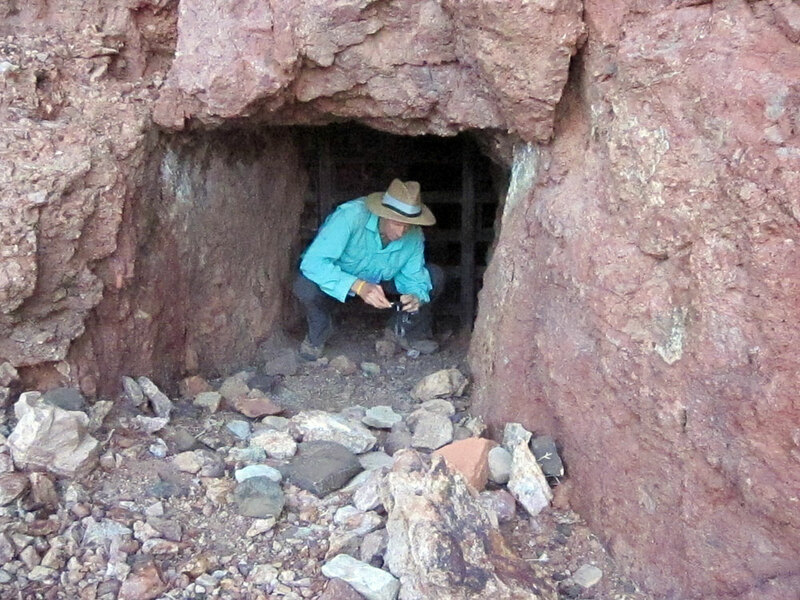 Chuck at Entrance to Mine Shaft. Old Log Cabin Used By Miners. We were still technically on the Beamer Trail, which ends at Tanner Canyon. 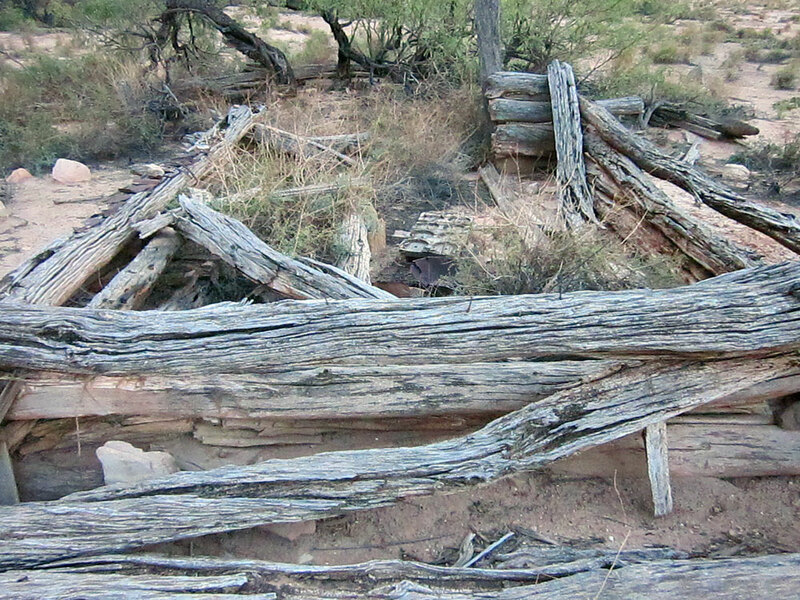 The section of the Beamer Trail between Palisades and Tanner was part of the infamous Horsethief Trail. 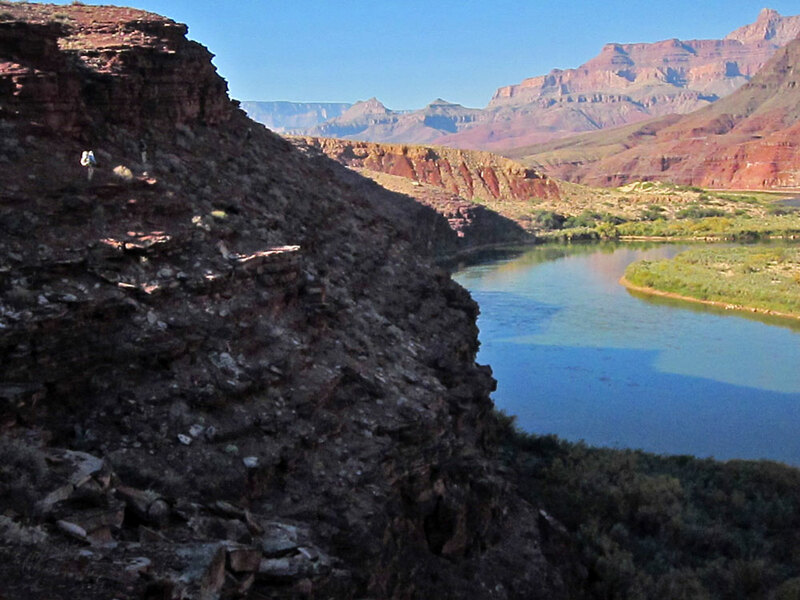 The story goes that thieves would steel horses from the south rim and take them across the canyon to sell them, altering their brands along the way. 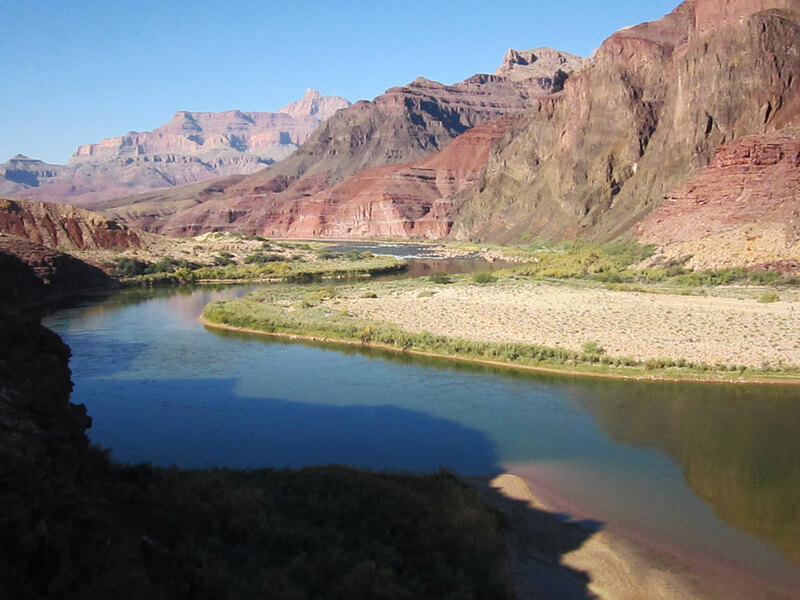 The part of Arizona on the north side of the Grand Canyon is called the Arizona Strip, and was very isolated from the rest of Arizona. The only way across the river was at Lee's Ferry. The route was down the Tanner Trail, then along the Beamer Trail to Palisades Creek, where they would cross the river and continue up the Lava/Chuar drainage to the Butte Fault. They allegedly would then follow the Butte Fault to Nankoweap and then out via the Nankoweap Trail. Hikers Approaching Cardinas Creek. Colorado River Between Tanner and Cardinas Creek. We stopped at Tanner Beach for a while and watched some rafts run Tanner Rapid. After arriving at Cardenas Beach, our destination for the day, I took a bath and lounged around for the rest of the afternoon. Tom and Chuck did some more fishing.